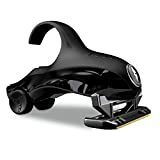 It is so easy to use and you literally put your figured through the handle and use the two wheels attached the razor to roll along your head and shave it. It sounds weird but it’s extremely effective and a popular head shaver. If you want to shave your head, you have a few choices you can make that involve electric shavers or regular razors. You could just buy a double edge razor and hack your head to pieces, but that doesn’t sound very appealing. No, you need a razor like the HeadBlade S4 Eclipse, that is designed specifically for head-grooming. In a hurry? See it on amazon here. First, the look of HeadBlade razors is interesting. Sleek, and is that a wheel? Yes, it is. An important trick to shaving your head is in getting the pressure right. The wheel drives the blade, and helps you to apply consistent pressure all over the skin surface. Since this can be an arduous process, not needing to put pressure on the blade makes it a more comfortable experience for you. HeadBlade offers an adjustable finger ring that allows a better grip on the device. It really is smooth and minimalist. You may think by looking at it that it’s fairly large and possibly unwieldy. But the length of the S4 Eclipse is only about the width of three fingers. Smaller than a safety razor. The S4 Eclipse blades themselves are similar to the replaceable cartridges of other razors. What sets HeadBlade apart are the little things that you never even knew you needed. The aforementioned wheel to ensure a safer, more comfortable shave, for example. If you want to use this to shave your face or body, you need only turn the blade around to use it like a conventional razor. There are other convenience features as well. The S4 Eclipse in particular is made from hand-polished stainless steel, and comes with a zippered, hard carrying case for travel. And you can easily get the sense that the company wants to make sure you’re satisfied, by including details video instructions that vary based on your specific needs. The stainless steel body appears to be the only major difference setting the HeadBlade S4 Eclipse apart from other models. That does drive up the price significantly. The S4 Shark comes in at marginally more expensive and features a different body design, presumably to improve grip. One of the things you really need to consider when using HeadBlade razors is the before and after shaving accessories. Now you surely can use regular shaving cream if you want to save money. There is nothing wrong with that at all. There are headblade products that are specifically for pre-shave activities. The HeadShed Lotion will help get rid of the dead skin and is a great pre-wash. You then of course have the Headslick shaving cream which really gives you a seriously smooth shave. They have special formulated lubricants to let the blade cruise right along your head for a killer close shave. Post shaving you need some sort of after shave treatment. Headblade does offer various options in their product lines which are HeadLube Glossy which helps moisturize your head with an added glossy shine, HeadBlade ClearHead Shave Treatment that helps to prevent those dang ingrown hairs and HeadLube SPF which is great because you have the 30 spf in it so you are protected when you go out in the sun. You can also view our Ultimate Guide On Electric Shavers For Bald Heads Here where I go int detail about head shaving options that include electric shavers. And as it turns out, it’s the stainless steel that customers like best. They felt that the cheaper models were just that, cheap. A few complained that the plastic body broke much more readily, and that the stainless steel was sturdier and had a better heft to it. Still, there were a few who complained that the S4 Eclipse was not easier to use for head-grooming than a conventional razor. Reviews were pretty evenly split on whether customers found their purchase a wise investment. The HeadBlade S4 Eclipse is a very enigmatic approach to shaving your head. It’s Discounted on Amazon, it’s certainly one of the more expensive razors you’ll buy. But its design offers the protection and flexibility for head-grooming that most other razors and electric shavers that are designed to shave your face do not. And with a 30-day money-back guarantee, it may well be worth a shot.